Welcome to the cottage "Bella Fagus". 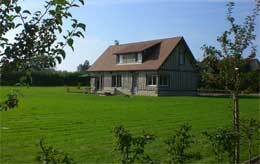 "A charming house in Normandy"
The House " Bella Fagus " is a charming country house located in the heart of the “Pays d’Auge” in Normandy. In authentic half-timbered construction, with its terracotta floor and timbered ceiling, you will appreciate the warm atmosphere in summer and as well as in winter around the fire place. Our cottage opens for you its doors for a weekend, a week or more. You will be welcomed and everything will be done to make your stay a memory in the countryside and with the best comfort. 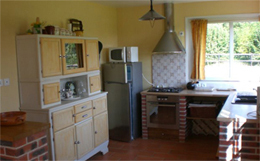 Around the cottage, you will find a very wide range of sporting activities or relaxation. 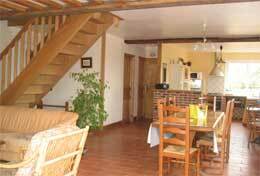 The cottage is situated approximately 15 minutes from the beaches of Deauville and Cabourg. 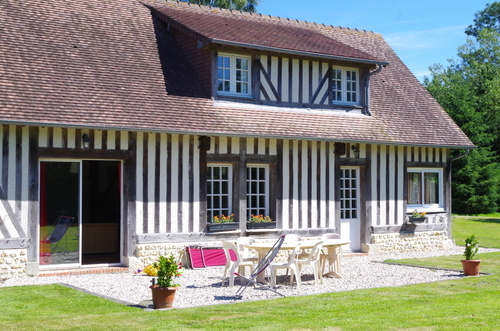 You can spice up your stay by visiting the traditionnal surrounding villages, the landing beaches, the Swiss Normandy, the Cotentin, the Pays d’Auge and enjoy the many cultural events organized by the region such as festivals (Deauville American Film Festival, Cinema Romantic Cabourg, the Equi’days ...). Many sporting activities are available such as horse riding, horse racing, golf, sailing ... Also, you can also enjoy your weekend by visiting the many flea markets held in the region. 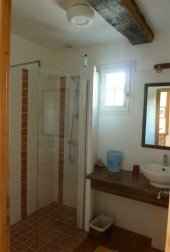 The cottage has two separate bathrooms and two independent toilets (ground floor and 1st floor). 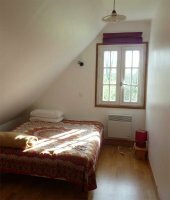 Our cottage has on the 1st floor two mansard bedrooms with double beds and one large bedroom with a double bed and three single beds. A cot is also available. If you wish, we can provide bed linens, towels and the house cleaning for additional fees. In the living room, in addition to the main electric heating, the fireplace will light up your evening in the living room. Ideal after a long walk on the beach or when the evenings are cool. The cottage has a television with satellite receiver and TNT (with roughly 150 different languages available) and a mini stereo and a DVD player. You will find in the dining room the large table for convivial meals. In the lounge there are two comfortable leather sofas around the coffee table. A wooden baby chair is also available. 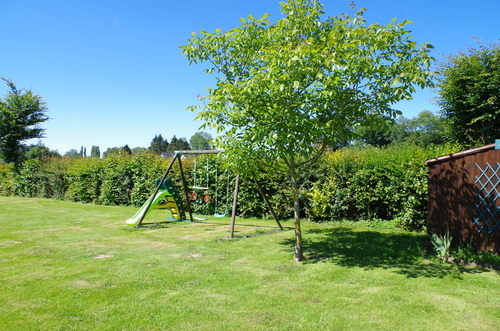 The garden is wide of 3,500 sqm and is well kept and completely surrounded by a with hedge hedgerow. 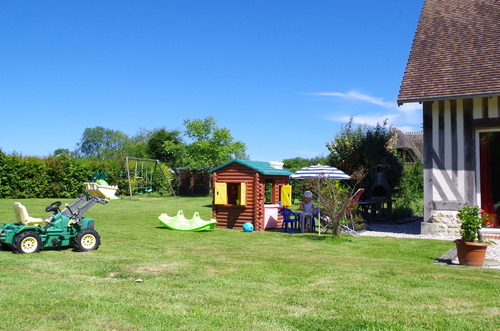 The garden is fully enclosed by a fence and secured for your children or your dog. It will be a source of joy for your children. The place is quiet and appropriate to chill out. A narrow drive provides you the access to private parking. To spend a beautiful day outdoors, you have a south-facing terrace with a large outdoor table, a barbecue place and deck chairs. The lawn is ideal for outdoor play. Please use the calendar to match your intended travel dates and availability. Please send us your inquiries by e-mail — we will reply promptly with further information on the rent and payment options. Note: Bookings are from Saturday to Saturday. Departures before 10am and departures after 16pm.